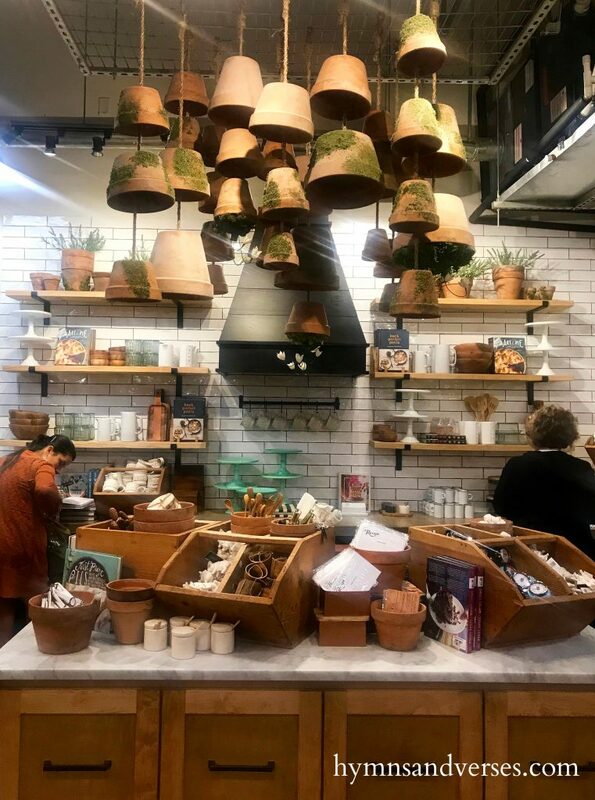 My visit to Magnolia Market was definitely at “pinch me” moment! 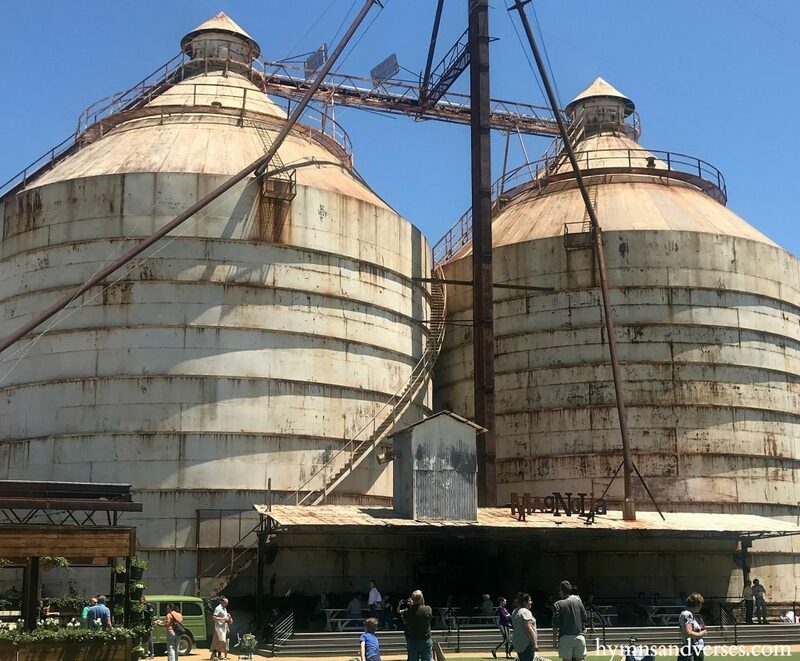 I followed along with Chip and Jo on Fixer Upper as they transformed two rusty silos and the surrounding area into a destination for Fixer Upper fans around the world! 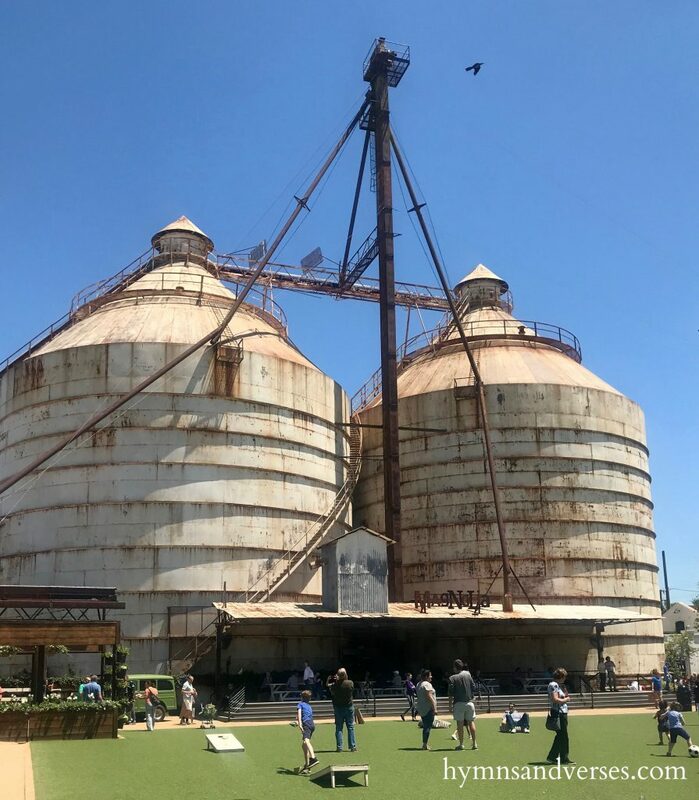 Can you believe that in 2017 Magnolia Market at the Silos had approximately 1.6 million visitors!!! That’s incredible! Chip and Jo have made Waco, TX a tourist destination! 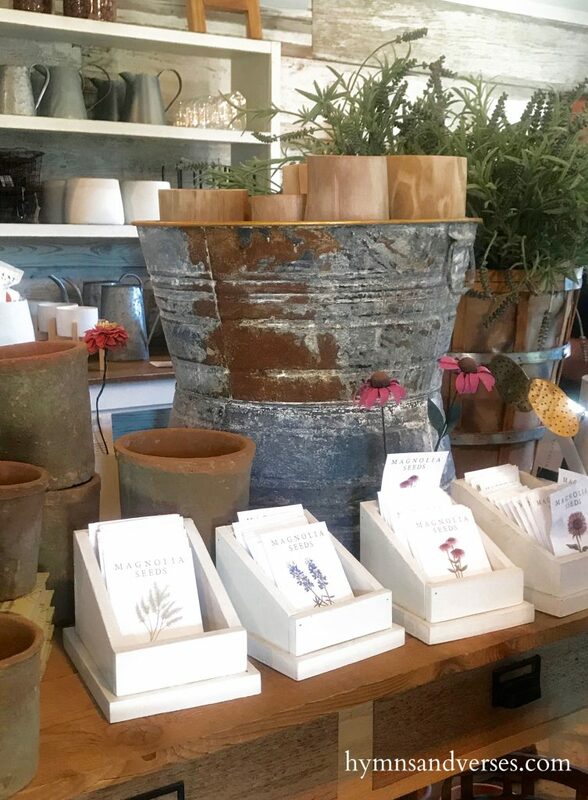 Today, I want to share some of my favorite things, a LOT of photos, and a few tips for your visit to Magnolia Market! 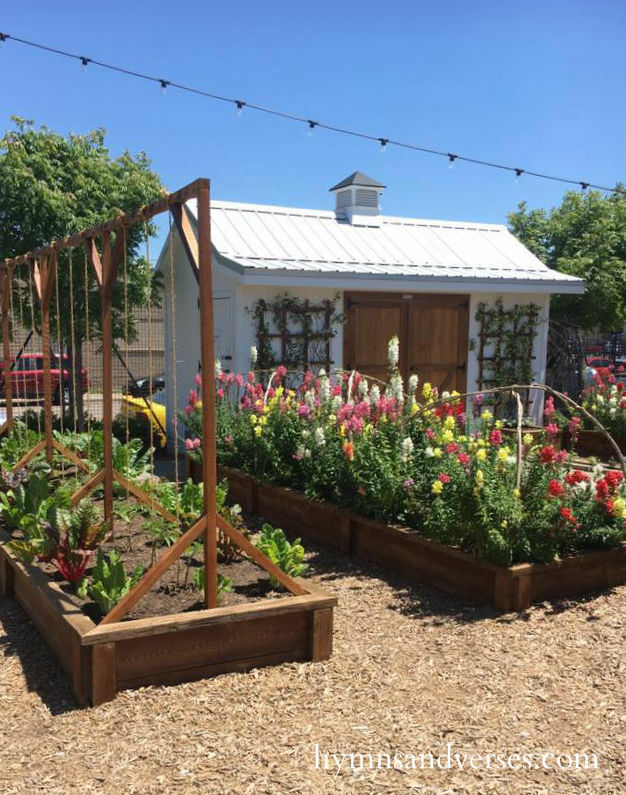 Ideally, you want to visit Magnolia Market on a weekday. We were there on a Thursday and it was busy, but not too bad. 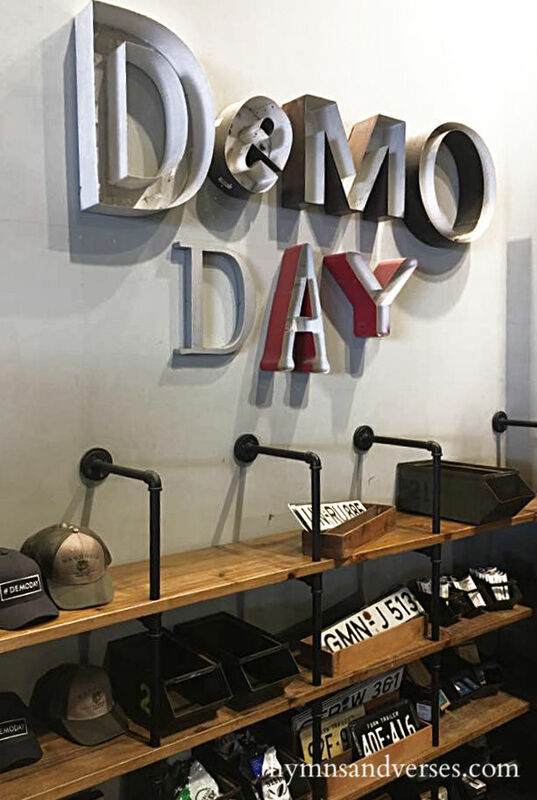 We heard from others, who were there earlier in the week, that Monday was the best day and each day following was a little bit busier. 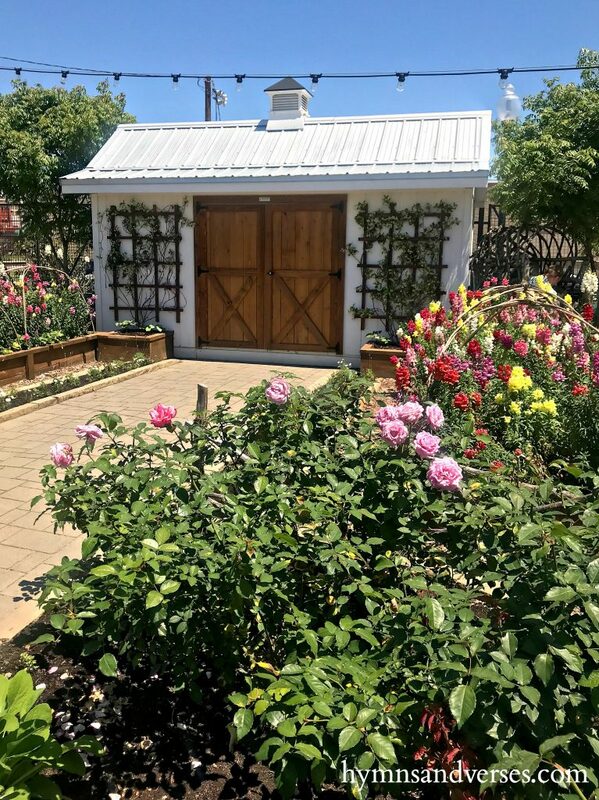 Of note, Magnolia Market is closed on Sunday – as is Magnolia Table restaurant. So, if you are going over a long weekend, get to all things Magnolia before Sunday. I also heard from friends who live in Waco that a lot of other shops are also closed on Sunday. The Market hours are 9 a.m. to 6 p.m. 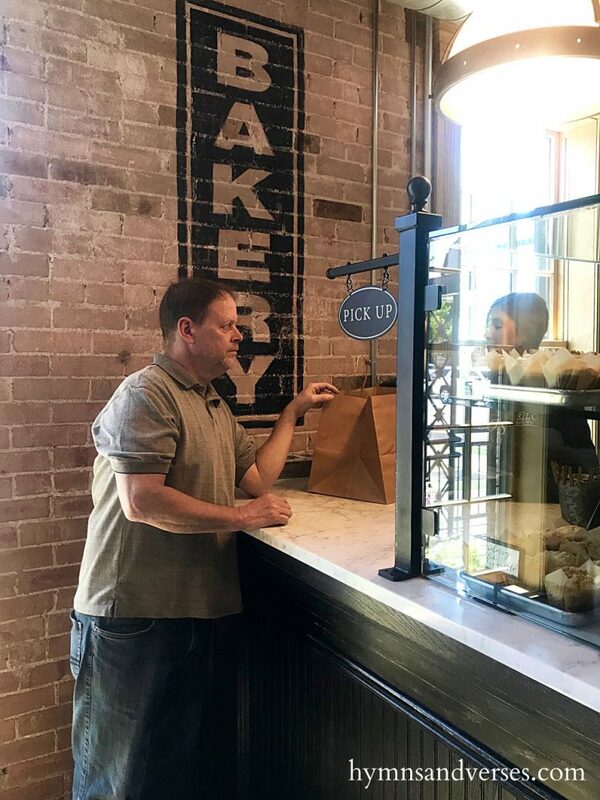 The Bakery is open 7:30 a.m. to 6 p.m.
We didn’t have any trouble finding parking in the Silos District. There are several churches nearby on Webster Avenue and they open up their parking lots for visitors to Magnolia Market. All seemed to charge $10 per day, which we thought was reasonable for the convenience. You can see how close we were able to park in the photo above. The Market is surrounded by an iron fence and the entrance is on 8th Street. Awkward picture of me below by the fence! 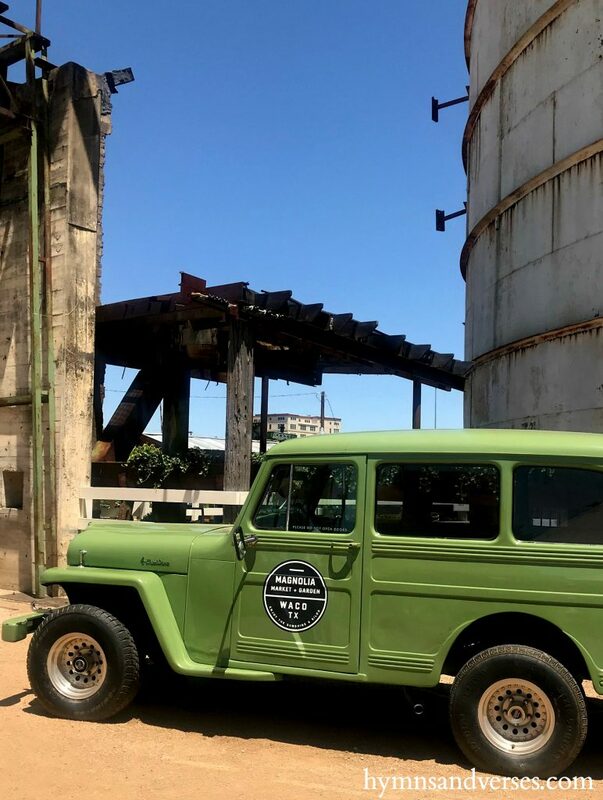 There are some FREE Parking areas in downtown Waco with access to the Silos District Trolley, which is also FREE! 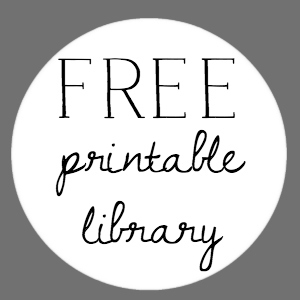 To see more about the Trolley, the route map, and FREE parking – click HERE. 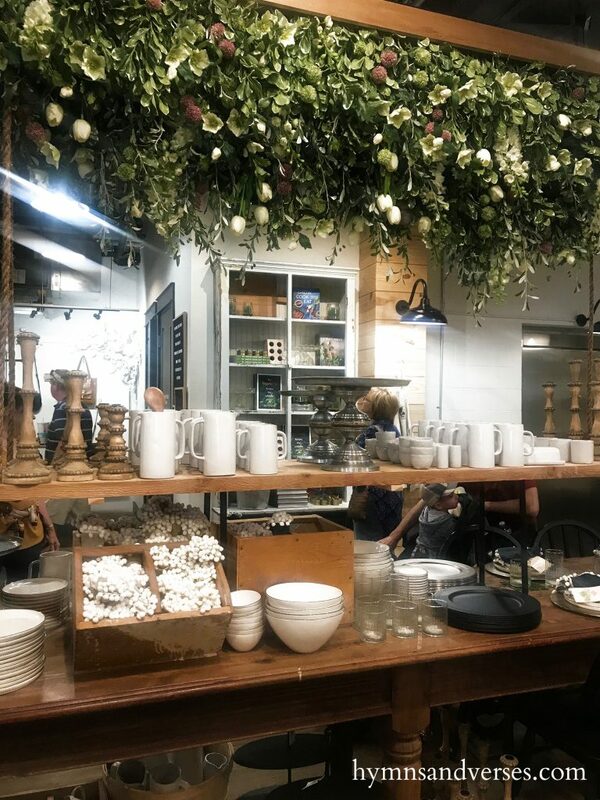 I mentioned on Instagram last week that this was my favorite part of Magnolia Market! 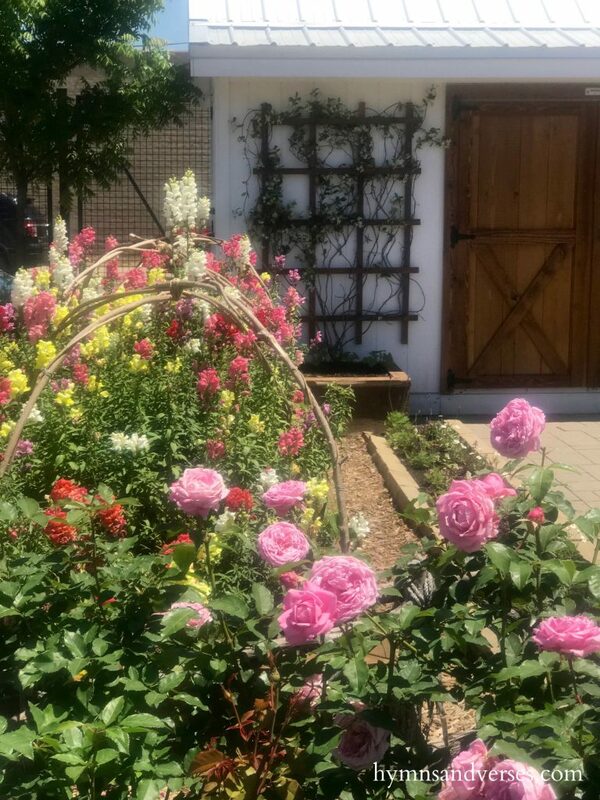 I loved the cottage style gardens with raised beds of roses and snapdragons! and the Seed and Supply Shop! (wish I had gotten a pic of the Seed + Supply Shop). But, you can see it HERE. 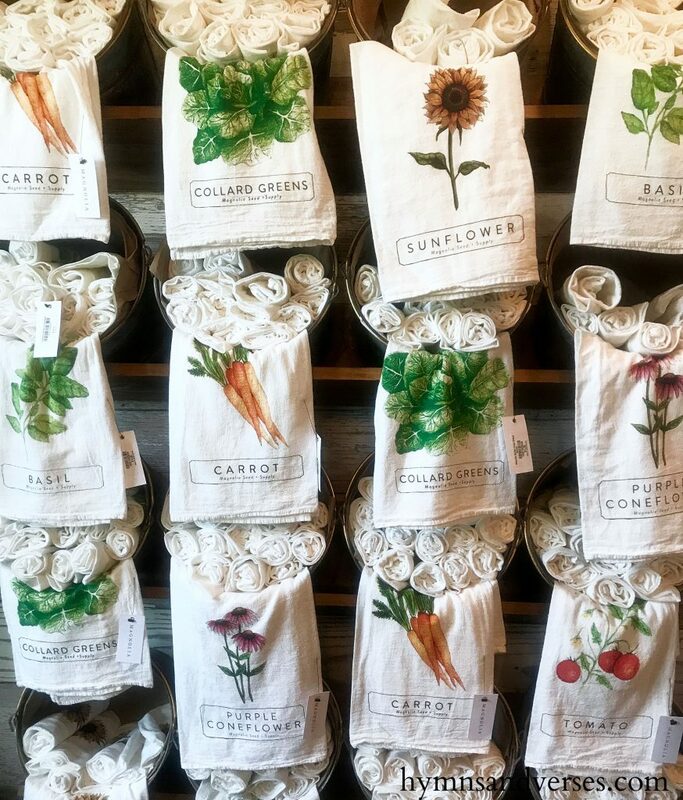 I loved the displays inside the Seed and Supply shop – here are a few! I purchased This T=shirt for me and some flower seeds (shown above). The shop was small, but packed full of old-fashioned gardening goodness!!! Because of packing space, I wasn’t able to purchase much! 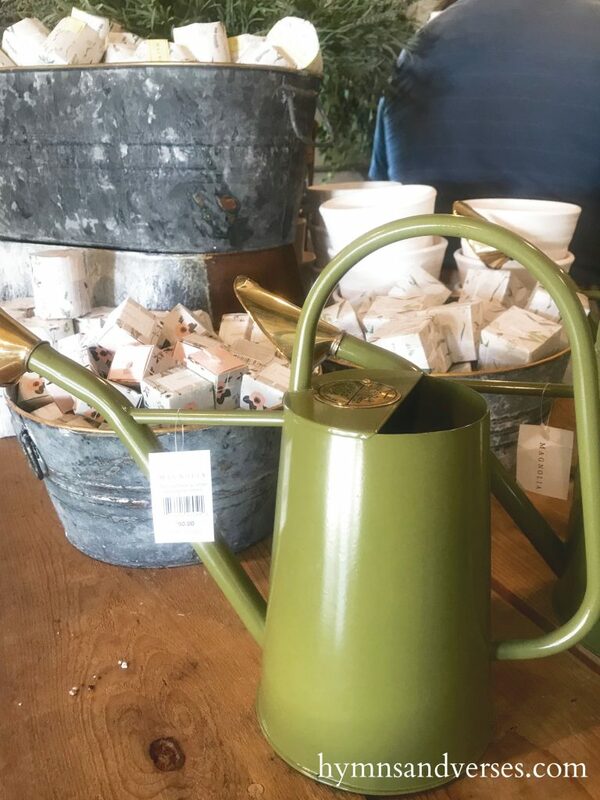 But, luckily, you can find a lot on the Magnolia Market Shop site. 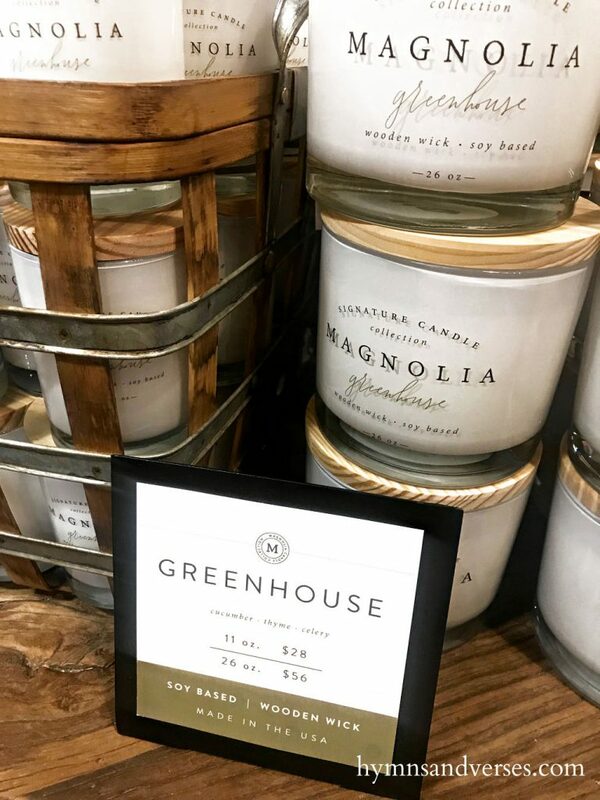 I loved the scent of this Greenhouse Candle! This adorable green wagon was parked between the gardens and the Silos. The actual market is the shopping hub! 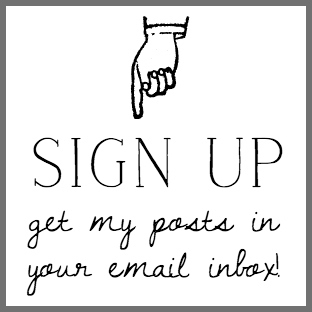 There you’ll find all things Magnolia from branded gear to JoAnna’s favorite jewelry and all things farmhouse! 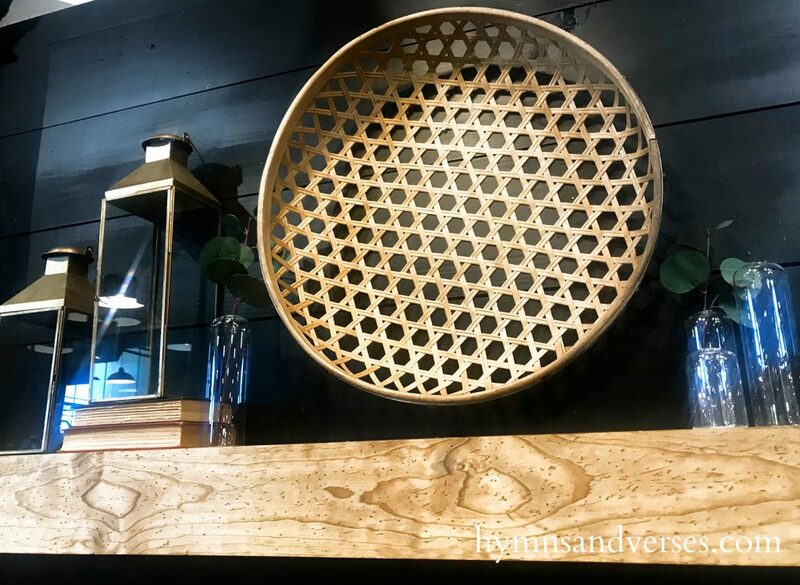 Here are a few photos of displays inside Magnolia Market! 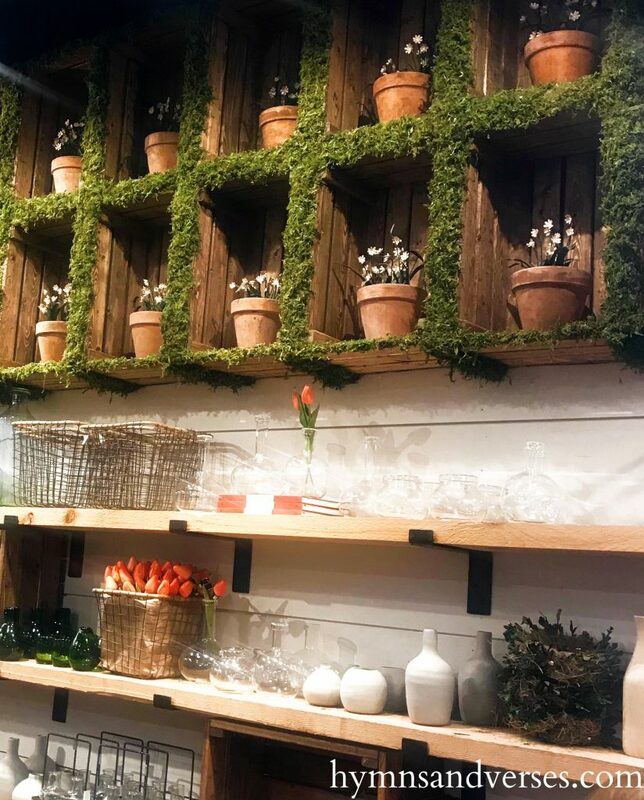 I loved this display of wooden crates on the wall with moss around the opening! Moss covered hanging flower pots – sigh! I would love to do something like this on my screen porch!!! This ladder filled with flowers was stunning! 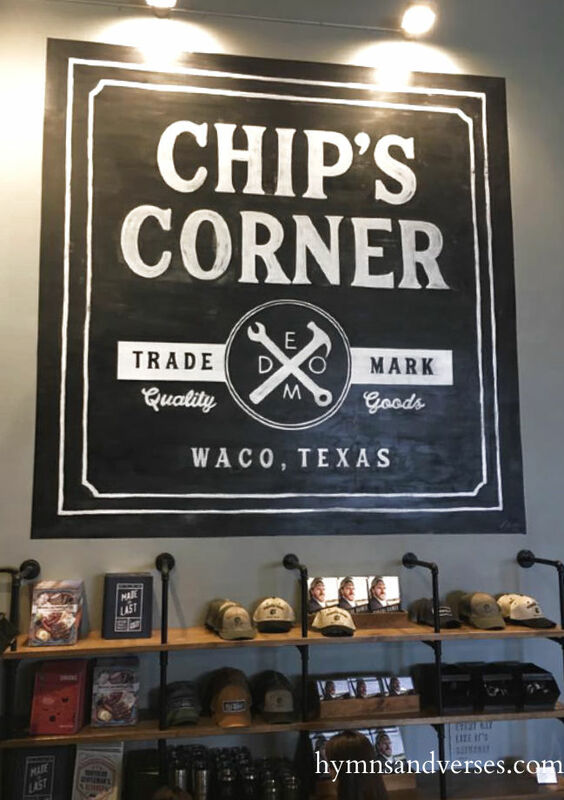 Chip’s corner was filled with things for the men in your life! This was my favorite thing that I wish I could have brought home! I loved this basket with the galvanized accents! Luckily, you can purchase it online and it’s on its way to my home now! I felt that the $28 price tag was very reasonable for the 23″ x 23″ x 5″ large size. 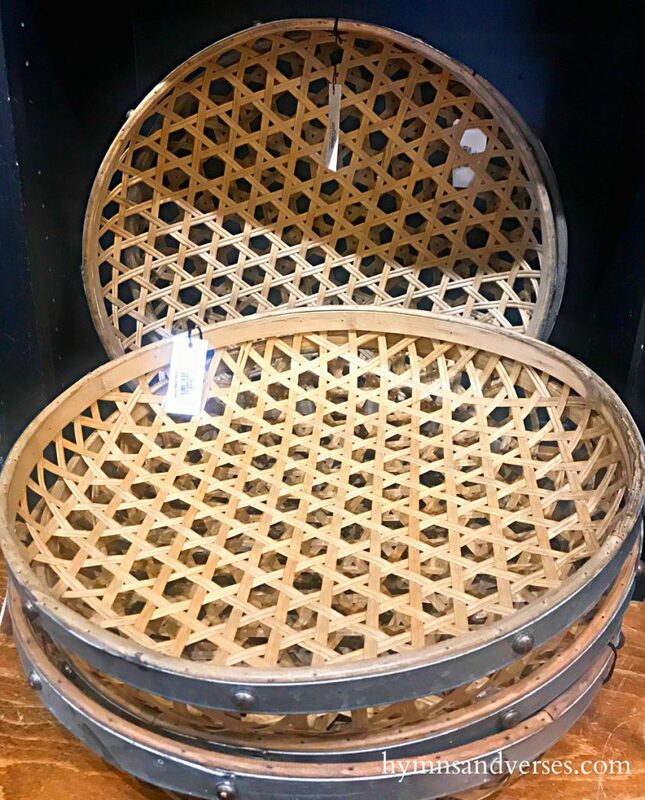 Here’s a shot of the basket displayed at Magnolia Market. Outside Magnolia Market are loads of places to just hang out and enjoy the day. 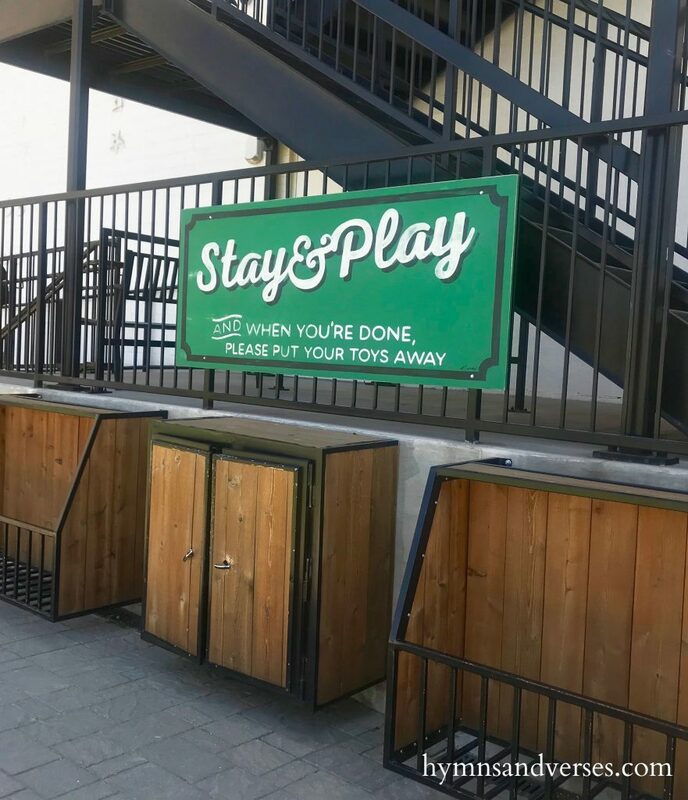 Here’s the green outdoor play area with lawn games and striped bean bag lounge chairs! The industrial architecture was put to good! There were some with picnic tables (shown below) and others with large wood swings! Perfect when you just want to take a break, have a bite to eat, or just people watch! The perimeter of this area is where you will find the food trucks! 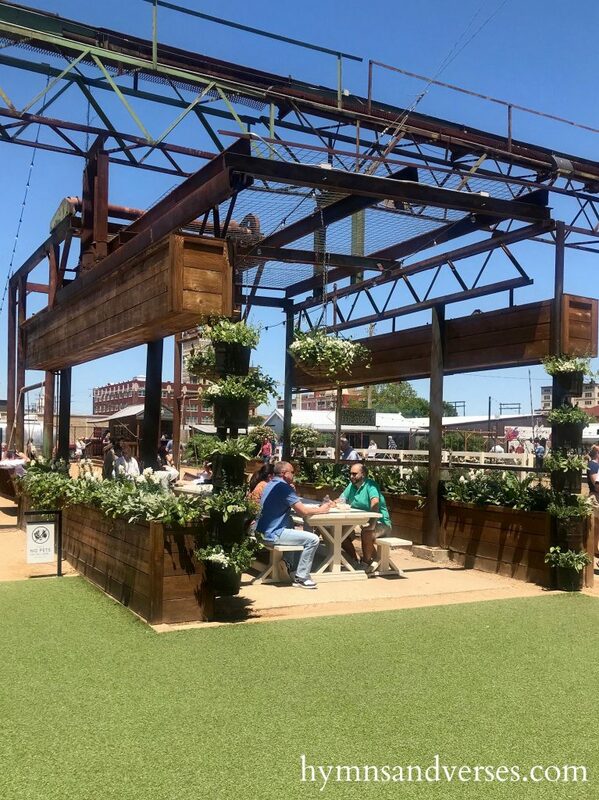 On Joanna’s blog you can find an “Inside Guide to the Food Trucks at the Silos”! When we were there, the Alabama Sweet Tea Co. truck was there and a must get is their 32 oz. glass mason jar of sweet tea with straw! Perfect for a hot, sunny Texas day! You get a cold drink + a large glass drinking jar with straw to bring home! I love mine! 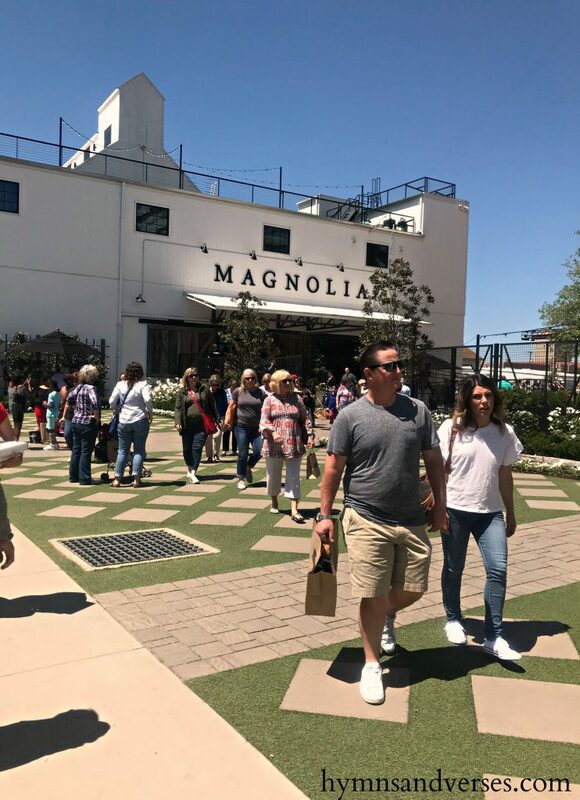 There are restrooms inside Magnolia Market, but there were long lines. There are more restrooms outside to the right of Magnolia Market near the food trucks. In my previous post about Magnolia Table, I said that the hospitality of the Magnolia staff was outstanding! We were greeted with smiles and conversation everywhere we went! 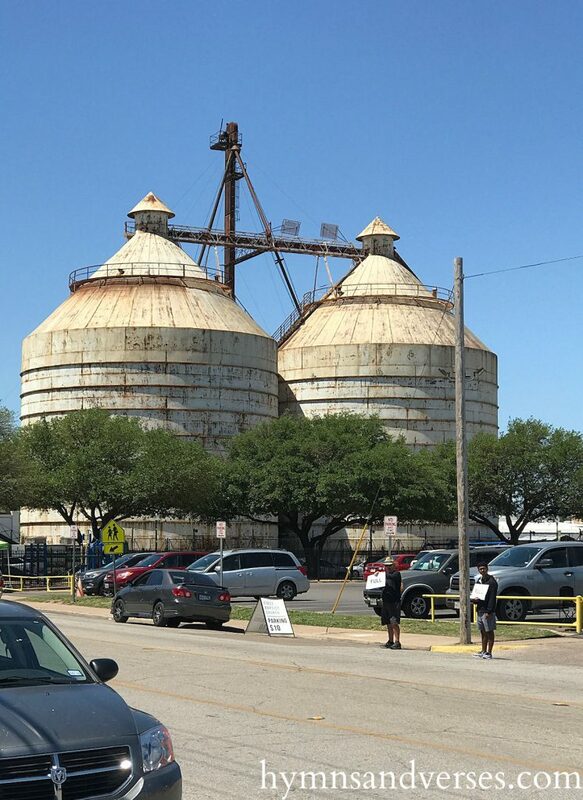 While waiting in line, we chatted with a gentleman on staff who told us the next project for Magnolia Market Silos . . . Chip is going to transform the inside of the left silo into a man cave hangout for the guys!!! How perfect is that! A place just for the men who visit with their wives and significant others! 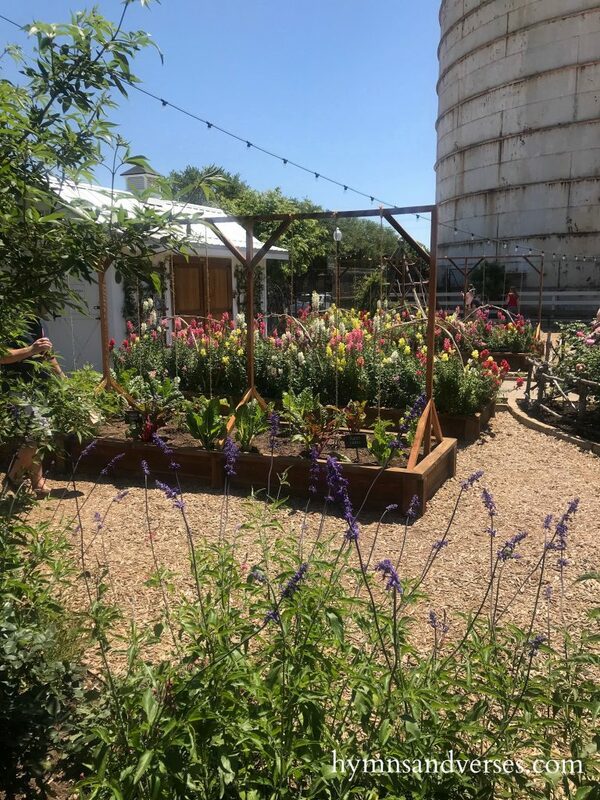 Lastly, a trip to the Silos would not be complete without a visit (or two) to the Silos Baking Co! We did this last and it was getting quite warm by then and we were tired too! And, unfortunately, when I get tired, I get lazy when it comes to taking photos! But, you can see some great shots of the Silos Baking Co. HERE. There was a short waiting line outside, but the time passed quickly! When you get in line, you are given an order card to fill out prior to entering the shop. This really cuts down on time! The actual shop is small, so guests are admitted a few at a time to keep it from getting too crowded. 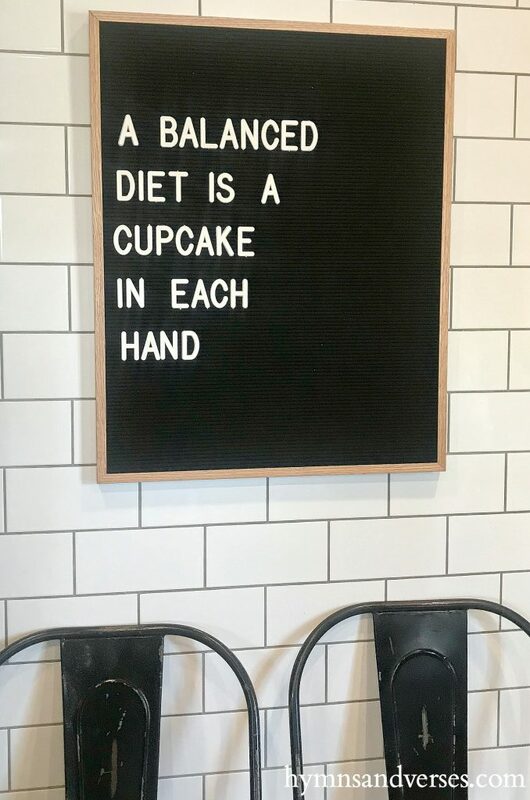 The cupcakes are huge and so moist! We each got just one! I got the Strawberries and Cream (strawberry cupcake with vanilla buttercream icing) and it was amazing. Mark got the Shiplap (vanilla cupcake with vanilla buttercream icing) and Connie got the Lemon Lavender (lemon & lavender vanilla cupcake with lemon buttercream icing) and they both said they were fantastic! There is cute seating area right outside of the Baking Co. to enjoy your cupcake! While waiting in line outside, I snapped this pic of the window box flowers! 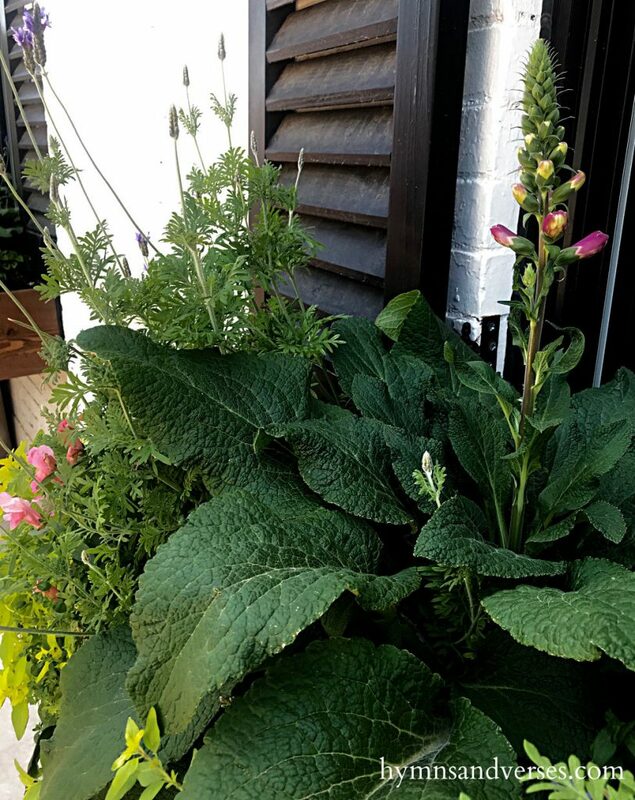 I loved the combination of flowers, especially the Foxglove, one of my favorites! Cute letter board inside Silos Baking Co.
Mark’s brother, Scott, picking up our cupcake order! Loved the brick walls and the bakery sign! 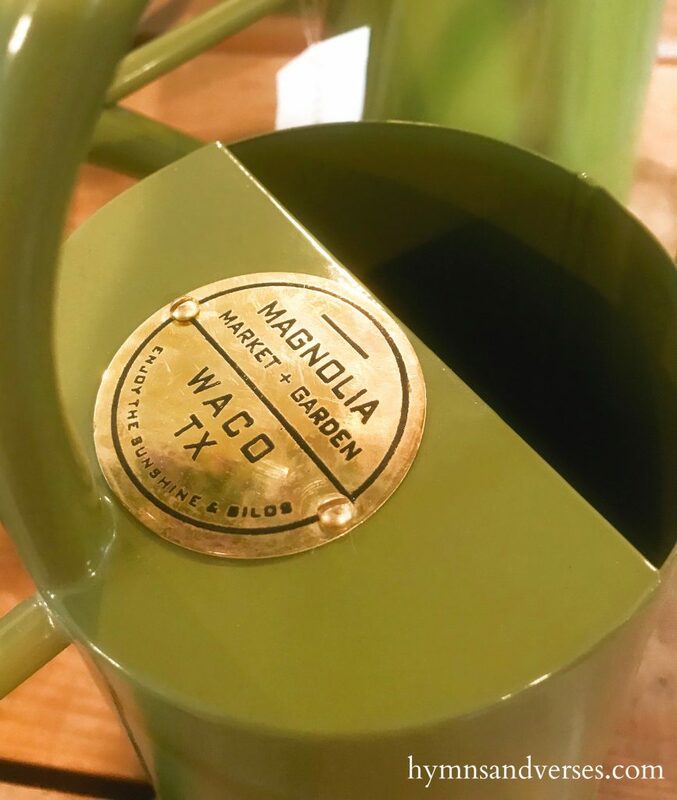 Well, that’s concludes today’s post about my visit to Magnolia Market and the Silos! I know it was long, so thanks for hanging in until the end! 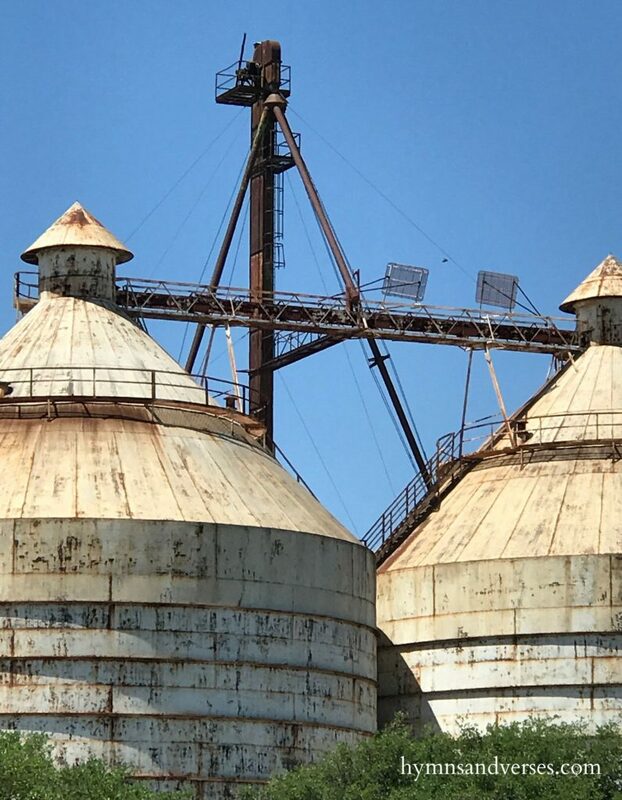 I hope if helps you to plan your visit to the Silos! If you missed my post about Magnolia Table Restaurant, you can read it HERE. 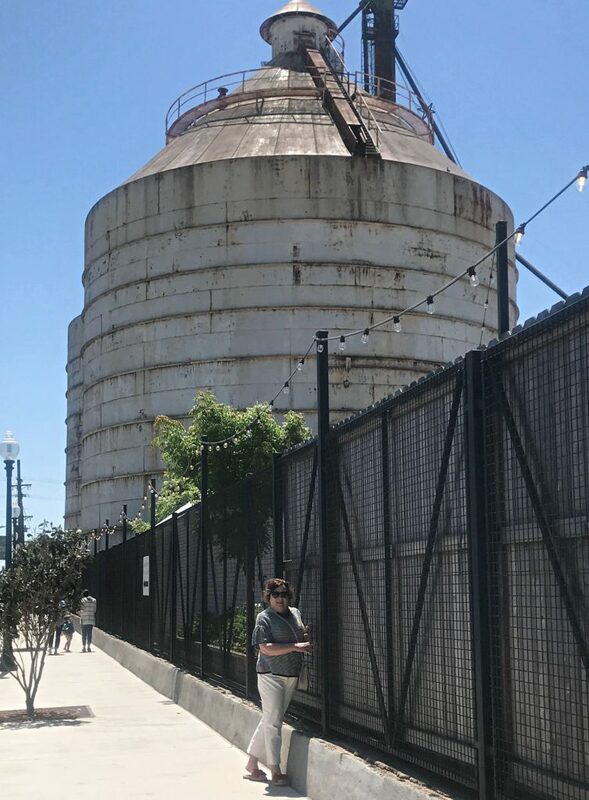 I’m so glad you enjoyed your visit to the Silos! I love going there whenever I visit my daughter at Baylor. I could just sit outside, listen to the music and enjoy all those food trucks all afternoon!! The Gaines’ have created a lovely space and a great hangout for friends and family. Loved all your great photos too! Love to you!! 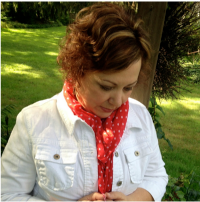 Wow, Doreen, thank you much for sharing the beautiful pictures from y’all’s trip down there. I bet it would have been easy to spend about 3 times as much as you did, as I know I wanted about one of everything I saw in the pictures! Everything was so awesome! I am glad y’all were able to go and that you had such a wonderful time. Great pictures and wonderful descriptions, glad you shared! Thank you for a wonderful review. I live in Oregon and hope to visit Waco some day. I love everything about the Gaines’ adventures. I hope you and your son going to be totally healed, soon. Thanks for sharing with this with us! Your pictures are so beautiful that I think I have to put this place on my bucket list now. Where did you stay when you went to Waco..
Hi. We stayed outside of Austin, which is about two hours from Waco. We were in Waco just one day. I am planning another trip this fall and I am planning to stay somewhere closer to Waco this time.